Brilliant astrology software for android based Mobile/Tab devices. When you are in a business meeting, family functions, or stuck in traffic and away from your computer, Future Point brings advanced astrology and detailed horoscope to your mobile phone. 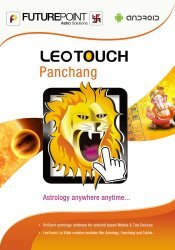 The Kundli software Leo Touch not only enables mobile users to generate horoscopes but also does horoscope matching, daily horoscope predictions, daily panchang and much more. The modern technology has brought revolution in the field of astrology by making it available on mobile phone too. Future Point has become a leading name for making astrology reach to common man through its various astrological softwares especially Leo Touch. 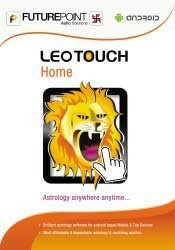 The most feature packed, fast and favourite software of astrologers, Leo Touch is the upgraded version of Leo Palm. 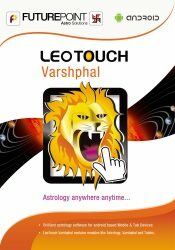 Leo Touch is undisputed, comprehensive and precise astrology software for android mobile phones. Touch mobile phones and tablets have taken over traditional smart phones so using this astrology application Leo Touch for modern phones / tabs sounds cool. It is a mobile phone application that has been designed for both the professional and enthusiast Astrologer to use on android mobile phone for the calculation and interpretation of 'Birth' or 'Natal' Astrology Charts. Specially designed for astrologer & astrology students who want to make horoscope for consultation or study purpose. It is also good for family who wish to cast horoscope for their family members or match horoscope of their children for marriage. 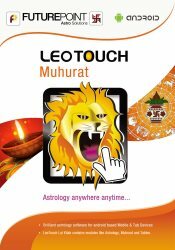 Kundli software LeoTouch Professional Edition is bestseller in the market of astrological softwares. This kundli software is most affordable & dependable astrology & horoscope matching software available today for astrologers. The power of Kundli Software LeoTouch Professional with Printing lies in its efficiency to print exactly like desktop software. Not only does it contain all features of LeoTouch Professional but there is one extra module of mundane astrology too in it. LeoTouch is very useful tool for astrologers, the calculations used are very accurate and I can proudly say that I can depend on it. the calculations used are very accurate and I can proudly say that I can depend on it. 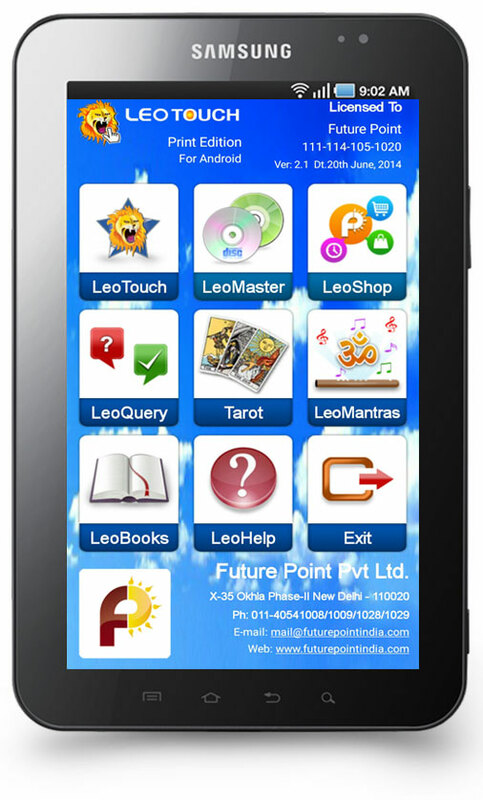 Astrology software LeoTouch presented by leading astrological company Future Point is easy computerized solution for complex astrology calculations and accurate astrology prediction. Kundli software LeoTouch can be termed as the champion of Vedic astrology calculations. The concept of computerized astrology in India was introduced by Mr. Arun Bansal who developed the first astrology software in 1978. 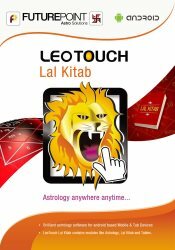 Kundli software LeoTouch which brought revolution in the field of Indian astrology is the result of extensive research work of 40 years in the field of computerized astrology. This horoscope software contains extensive horoscope calculations with remedies and predictions. Jyotish software LeoTouch took astrology closer to common people's interest. Horoscope software based on vedic astrology gives method of matching soul mates. Lal Kitab and Panchangam modules of this Kundli software are very popular. The horoscope software is extremely popular for its accuracy and credibility. Parashar astrology based software LeoTouch incorporated different astrology systems and all aspects of astrology with comprehensive Calculations, Remedies, Predictions, Various Charts, Dashas, Teva, Astrology, Matching, Varshphal, Numerology, Horary, K.P, Lalkitab, Muhurat, Panchang, Mundane, Books, Calendar, Transit, Mantras and lots of other astrology information. 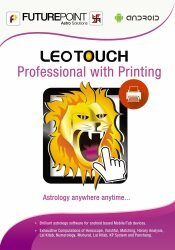 LeoTouch astrology software is used by all professional astrologers, astrology reaserch institutes, computerized astrology centres and students of astrology all over the world. This astrology software is available in more than 12 languages including Hindi, English, Tamil, Bengali, Gujarati, Marathi, Panjabi etc. This Indian astrology software can be termed as the best representative of Vedic astrology.